While the history of guns goes all the way back to the hand-cannons used by the Chinese, at no point in time in history did rifle technology and usage become as important as it was during World War II. While World War I showed how important an accurate, high quality rifle was, it wasn't until WWII that the importance became significant, mostly due to the fact that such large companies of infantry were involved in ground campaigns. Bolt action, magazine fed rifle originally introduced in 1891 was used by the Italians in various campaigns throughout Europe and South Africa. Once Italy surrendered to the Germans in September 1943, many of these captured rifles were issued to Germany's "People's Milita" troops. These rifles were also sold to the Finnish, but the Finns would discard them whenever possible for a better, more reliable rifle on the battlefield, most often for the Soviet Mosin-Nagant. Italy also sold a large number of these to the Japanese prior to WWII as well. Soviet bolt action, magazine fed rifle originally developed and issued to the Imperial Russian Army starting in 1882. This rifle saw action in the Russian Civil war, and in various battles with the Finnish throughout the early 20th century. Various modifications were made to the rifle, including modifications to create sniper rifles which were very effective in the Battle of Stalingrad (August 1942-February 1943) while the standard issue rifles were used for urban combat in the streets. Bolt action rifles issued to Imperial Japanese Army troops. The Type 99 was designed to replace the Type 38 since it was chambered to use the more accurate 7.7mm ammunition. 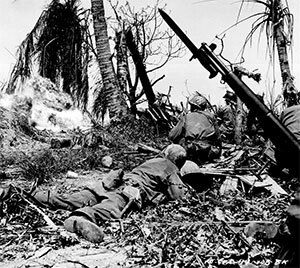 While the Second Sino-Japanese war convinced the Japanese of the superiority of the ammunition, the Pacific War portion of World War II started before the Type 38 was completely replaced, necessitating the use of both rifles by the Japanese in WWII. Bolt action rifle manufactured by Mauser, this eventually became the service rifle issued to the German Wehrmacht (Defense Force) and saw continuous use until the end of World War II in 1945. It was widely used by all branches of the German military and was a favored capture weapon by the Soviets due to a lack of small arms available to Soviet troops at the beginning of WWII. At the end of WWII, the Soviets captured millions of these weapons and continued to refurbish and issue them to Soviet troops well into the 1950's. British bolt action, magazine fed rifle originally introduced to British troops in 1895, saw continuous use as a British service weapon until 1957. It is still the standard issue service weapon for many troops in India and Bangladesh, making it the longest serving military weapon in history. Two versions of the Lee-Enfield were produced, the No. 4 Mk I and No. 5 Mk I. While the No. 4 became the rifle most used, the No. 5, aka the "Jungle Carbine", was very popular because of it's lighter weight and shorter length. Unfortunately, it had accuracy issues (tested out to have a "wandering zero" or couldn't be sighted in reliably) and was discontinued. Standard issue service rifles for the United States during WWII. While the Springfield bolt action was in the process of being phased out in favor of the M1 and M1A1, it was still heavily issued to infantry troops. The M1 and M1A1 semi-automatic rifles had a higher rate of fire and held more rounds than the Springfield. The M1 was popular due to it's light weight, shorter length and simplicity of use, but relability and accuracy was mixed. Being a short-stroke gas design, a selective fire version was created as a fully automatic assault rifle and designated the M2. Many of the rifles used during World War II used designs based in the late 1800's. This meant most of them were bolt action which meant fairly slow cycle rates, but were effective as infantry and cavalry weapons. As automatic weapons and semi-automatic weapons became more popular as well as the effectiveness of air strikes and tank usage through the end of WWII, the impact of most of these rifles, except those modified as sniper rifles was lessened. Today, many of these rifles, both captured during battles or cached are becoming very popular collectors items, some going for thousands of dollars at gun shows and auctions. World War II was a time of heavy conflict around the world, with virtually every country involved in one way or another, and the rifles described in this article, while the main rifles in use by the largest and most active participants, is only a sampling of all the rifles, as well as the other armaments used.